Indicates the speed of rotation of the engine (x 1000 rpm). Indicates the temperature of the engine coolant (° Celsius). Indicates the quantity of fuel remaining in the tank. Indicates the current speed of the moving vehicle (km/h or mph). Starts a manual CHECK and recalls the service information. Resets the function to zero (trip distance recorder or service indicator). 8. Instrument panel lighting button. Adjusts the brightness of the lighting of the instruments and controls. For more information, refer to the section on the button or function and its associated display. (miles or km) B. Distance recorder. C. Engine oil level indicator, service indicator. These two functions are displayed when the ignition is switched on, then disappear after a few seconds. The following functions are displayed depending on the selection. - Warning lamps / CHECK. - Speed limiter / Cruise control. - 6-speed electronic gear control or automatic gearbox. - Navigation - Guidance / Trip computer. 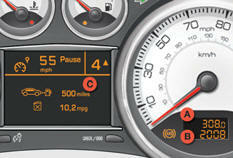 - Vehicle and screen parameter settings menus.